AeroPanel produces panels to your specifications to meet your needs. Via our relationship with Insco we are able to produce products that satisfy your Integrated Control requirements. See our Product samples shown below. INSCO™ designs completed integrated control switch panel displays using materials, components and finishes that meet advanced commercial and military system requirements. 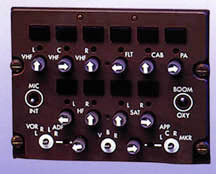 The control panels provide primary data entry channels for equipment users in communication, navigation flight control, fire control, mission management and other critical system capabilities. The integrated control panel can be provided with lighting which is NVG Compatible, Electroluminescent, LED or Incandescent.